ABC Family's 16th Annual 13 Nights Of Halloween Scares Up Fun Starting Oct. 19 - Are You Screening? I have to admit that I’m a fan of ABC Family in general, and there aren’t many of their original shows that have let me down, but their holiday efforts are among my favorite television “events,” and it’s closing in on Halloween again. The 16th Annual 13 Nights of Halloween is starting in a month and a day, and you should make sure you have your calendar marked with all the opportunities. 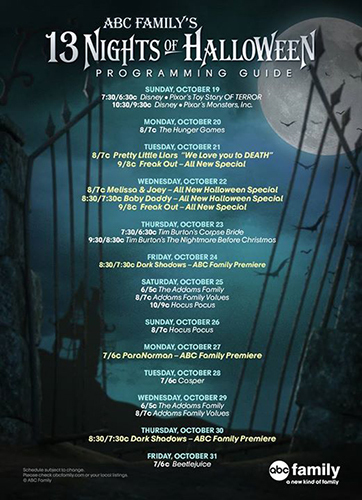 It is slightly repetitive, and a little Tim Burton heavy (if there is such a thing for an event centered around Halloween), but the programming has become a real tradition, and there are three shows with Halloween specials, and a reality prank program in the mix. Plus, you’ve obviously got all your Halloween staples to enjoy, and a good mix of your favorites and new entries. Catch all the info below, get a tease of the Pretty Little Liars special, and make sure you know where to be and when. ABC Family brings the thrills and chills with 13 NIGHTS OF HALLOWEEN, a celebration filled with scares as you countdown to Halloween. The popular programming event, now in its 16th year, starts Sunday, October 19th and concludes on Friday, October 31st. The fright fest features brand-new Halloween-themed episodes of “Melissa & Joey” and “Baby Daddy,” an all-new “Pretty Little Liars” fan appreciation special, plus the hilariously scary prank specials “Freak Out.” The stunt will also include the network television premieres of “Dark Shadows” and “ParaNorman,” and a ghoulish mix of Halloween-themed programming. It’s Halloween, Witches, and “A” is up to his or her usual tricks, as ABC Family presents the “Pretty Little Liars” fan-appreciation special, “We Love You to DeAth” (8:00 – 9:00 PM ET/PT; encore at 12:00 AM ET/PT). Then stay t uned for “Freak Out” (9:00 – 10:00 PM ET/PT; encore at 1:00 AM ET/PT), the hilariously scary new hidden-camera prank special. Each special will feature an unsuspecting mark whose fears come to life before their eyes with elaborate hoaxes deviously tailored with help from the victim’s friends and family. Stay in bed all day and enjoy monster madness. Start with an encore presentation of “Freak Out” (7:00 – 8:00 AM ET/PT), followed by “Coraline” (8:00 – 10:00 AM ET/PT), a little girl who discovers the life she dreamed of is more sinister than she thought. Then grab the Scooby snacks for “Scooby Doo 2: Monsters Unleashed” (10:00 AM – 12:00 PM ET/PT). We dare you to take a tour through “The Haunted Mansion” (12:00 – 2:00 PM ET/PT), followed by “Corpse Bride” (2:00 – 4:00 PM ET/PT). “The Addams Family” (4:00 – 6:00 PM ET/PT) invites you to spend the evening with them and learn some “Addams Family Values” (6:00 – 8:00 PM ET/PT). Something wicked this way comes as the Sanderson sisters work their magic in “Hocus Pocus” (8:00 PM – 10:00 PM ET/PT). And finally, the network television premiere of “ParaNorman” (10:00 PM – 12:00 AM ET/PT), about a young boy who can talk to the supernatural. Join Morticia, Gomez and the rest of “The Addams Family” (4:30 – 6:30 PM ET/PT) in “Addams Family Values” (6:30 – 8:30 PM ET/PT). It is followed by a Tim Burton double creature feature with “Dark Shadows” (8:30 – 11:00 PM ET/PT) and “Beetlejuice” (12:00 – 2:00 AM ET/PT). A day of truly spine-tingling frights starts with encore presentations of “Melissa & Joey” (11:00 – 11:30 AM ET/PT), “Baby Daddy” (11:30 AM – 12:00 PM ET/PT) and “Freak Out” (12:00 – 2:00 PM ET/PT; encores at 12:00 AM ET/PT). Then…they’re heeeerrrreee! Back to back airings of otherworldly battles between some truly wicked spirits in Poltergeist (2:00 – 4:30 PM ET/PT), “Dark Shadows” (4:30 – 7:00 PM ET/PT), “Beetlejuice” (7:00 – 9:00 PM ET/PT) and “Casper” (9:00 – 11:00 PM ET/PT).